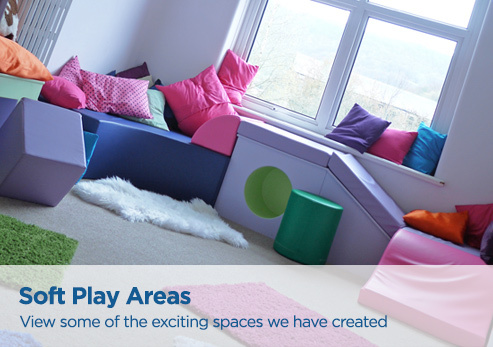 To the Foam for Comfort website where we offer a wide range of quality Reflex Foam & 100% Natural Latex interiors, Fitted Covers, Mattresses & Toppers/Overlays. 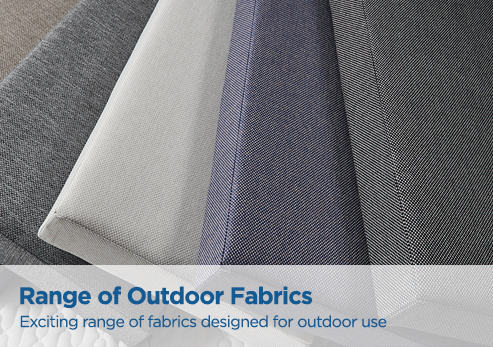 Specialist products such as packing foams, church kneelers & pew runners, boat units & mattresses, soft play units, window seats and outdoor seating areas. 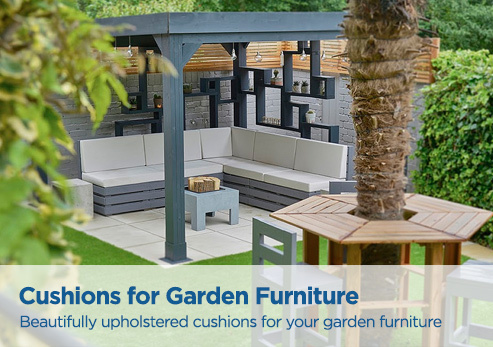 Backed up with services such as professional cushion refilling, CAD design for outdoor seating and soft play areas, a free advice line and the assurance of a well established company that still likes to speak with its customers. New year, new levels of comfort! We have just launched our brand new 100% Natural Latex, Pure Comfort. Be sure to view our new video and discover all the reasons why you may want to choose 100% Natural Latex for your next project! Ensure your foam is cut correctly! 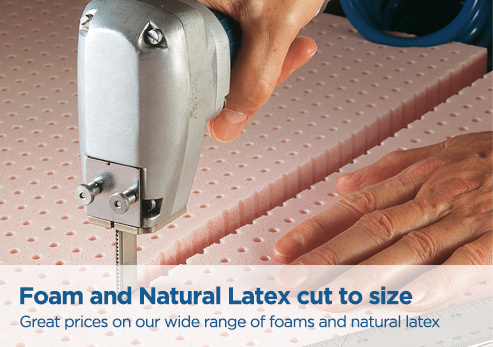 Unlike many of our competitors we have invested in high-tech cutting machines to ensure your foam is cut both accurately and extremely neatly. You can see our cutting machines in action in our brand new video. What can I say! absolutely wonderful, I now have the equivalent of a new suite for the price of four cushions. Marvellous!! Thank you a thousand times. Cushions are excellent. Clearly your company meet your statement of “designed to suit you” very well indeed. I certainly can not recommend you highly enough. So many companies nowadays make the customer feel that they are doing the company a service by using them. At Foam for Comfort it is very much the other way round. Cushions arrived this morning, they're on the settee now and so comfortable, what a difference! I just wish all companies had service like yours. From a very satisfied customer. The cushions are wonderful. Thank you for a most professional and hassle free service. Everything went like clockwork from my initial enquiry right through to delivery. Many thanks for a job very well done. We are so pleased with the end result. The cushions refilled by you have made our suite look like new again, which has saved us hundreds of pounds. Thank you so much for dealing with my order for two mattresses with such efficiency and promptness. I would also like to thank your friendly staff. Just a quick email to thank you and your staff for your excellent service. I'm absolutely thrilled with my new cushions, my suite looks like it did ten years ago. We would just like to thank you for the advice you gave me on which type of product to use. 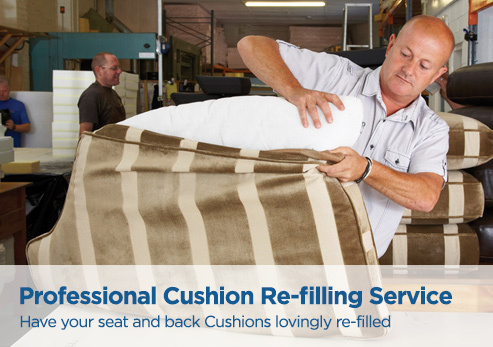 We are delighted with the quality of the filling of each of the cushions. I am writing to say thank you for the great job you made of my fitted covers, they are a perfect fit and colour. I could not have wished for better. I will recommend you to all my friends. I feel that I must write to congratulate you on the quality of your foam product, the speed of completion of my order and the value for money of your service. I have suffered with a bad back for the last six months. Your mattress overlay put back the resilience into my bed and after three days my back is free of pain. I received my new made to measure mattress this morning, seems very well made and should be extremely comfortable. Many thanks for a great and speedy service, will use you again! I am very pleased indeed with the one-off mattress that you made for me recently. I noted with satisfaction the care and intelligence with which it was packaged. I would like to thank you for an excellent service. We bought a foam mattress from you and you delivered it on time, in perfect condition for the right price, what more do we need to say! My seat cushions arrived this morning and I am now sitting comfortably in my chair. I am delighted with the result and will recommend you to my all my friends. Unlike many companies these days that only exist online and operate from unknown locations and are only contactable via email. 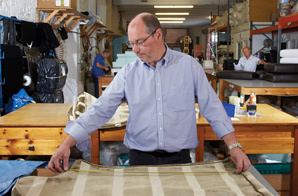 We have a showroom and a factory with friendly staff that you can come to for helpful advice. While you are welcome to call into our showroom at any time for general information, we do ask you to phone and make an appointment if you want to try products out, obtain a quote or discuss a project just to ensure the products and staff are available. We are based in Kirkstall, Leeds and we are open Monday to Friday 9am to 5pm.